Earlier today,Chief Prosecutor of the International Criminal Court Luis Moreno-Ocampo briefed the UN Security Council about the situation in Darfur, urging the international community to act on the Court’s arrest warrants for Sudanese officials and lambasting Chad and Malawi, which are both State parties to the ICC, for failing to arrest President Bashir on recent visits. The execution of the arrest warrants will end the crimes in Darfur. The individuals sought by the court are still allegedly committing genocide and crimes against humanity in Darfur. The world knows where the fugitives of the court are. They are in official positions, controlling the Government of Sudan commanding military operations in different parts of the Sudan. He is correct in recognizing that the same cast of characters from the Sudanese government implicated by the ICC in crimes in Darfur continue to hold sway and dictate the military’s strategy in South Kordofan and Blue Nile—a fact pointed out by the Enough Project’s analysis of the Court’s request for an arrest warrant for the Sudanese minister of defense. The prosecutor urged the Security Council to support the execution of arrest warrants for Sudanese President Omar al-Bashir, Governor Ahmed Harun, Janjaweed leader Ali Kushayb, and Defense Minister Abdelrahim Mohamed Hussein, all of whom have been accused of committing genocide, crimes against humanity, and war crimes in the Darfur region of Sudan. But the crimes of these individuals do no stop in Darfur. In addition to well-documented instances of indiscriminate bombing and forced displacement of civilian populations in South Kordofan and Blue Nile, there is evidence of ethnic cleansing of the Nuba people on the part of the government of Sudan. The international community was once able to prioritize justice and civilian protection over bilateral relations with the Government of Sudan as well as put aside ideological differences regarding the ICC. In 2005, the UN Security Council passed resolution 1593 referring the situation in Darfur to the Court. Given that Sudan is not a state party to the Rome Statute, the ICC may only exercise jurisdiction over crimes committed within Sudanese territory or by Sudanese nationals in one of two instances: (1) the UN Security Council refers the situation to the ICC, or (2) the state in question, in this case, Sudan, accepts the jurisdiction of the Court. As option (2) is highly unlikely, it must be assumed that the only option for the ICC to gain jurisdiction to investigate crimes committed in South Kordofan, Blue Nile, and Abyei is through a UN Security Council resolution. Indeed, it is only through such a show of international support for the norms of justice, the end of impunity, and human rights can the people of South Kordofan, Blue Nile, and Abyei see the individuals responsible for gross human rights violations be held accountable. Enough urges the expansion of the ICC’s mandate to include the investigation of crimes taking place outside of Darfur. Since the only legal mechanism to achieve this broadened jurisdiction is through a Security Council resolution, Enough urges the international community—specifically the five permanent members of the UN Security Council—to end impunity for crimes committed in South Kordofan, Blue Nile, and Abyei, and seek justice for the gross human rights abuses rampant in these regions. Read the full fact sheet on the request for an arrest warrant for Defense Minister, General Abdelrahim Mohamed Hussein. 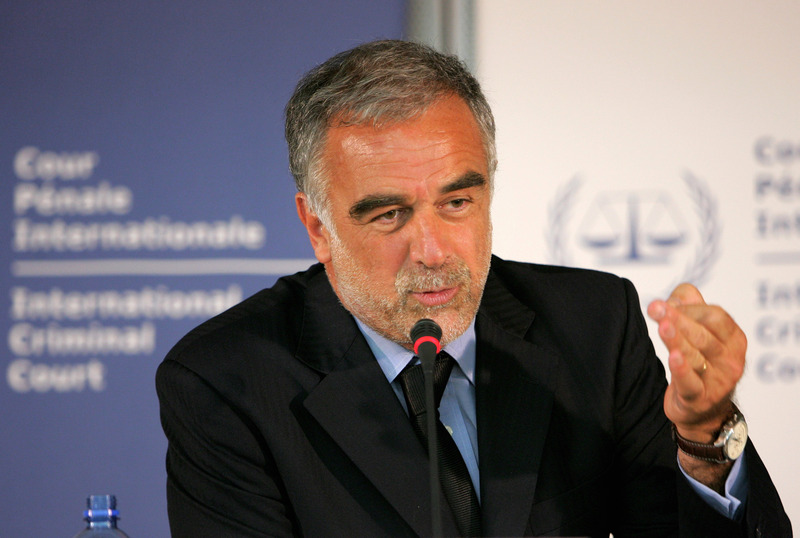 Photo: ICC Prosecutor Luis Moreno-Ocampo reacts during a press conference in The Hague, Netherlands, on Feb. 27, 2007, when he named former Sudanese minister Ahmad Muhammed Harun as a suspect for war crimes in Darfur (AP Photo/Peter Dejong).